The farm Newlands situated in the Mankazana mountains in Bedford District, Eastern Cape Province has recently been converted into a game ranch, fenced with a 2,4 m game fence and amalgamated with the farm Stanley that has been a game ranch for a decade. It’s a simple enough scenario, and follows the widespread trend for marginal farms to be converted to, or amalgamated with, a game ranch. However, due to decades-long overgrazing, most former stock farms are in desperate need of veld rehabilitation to repair the land and improve carrying capacity. 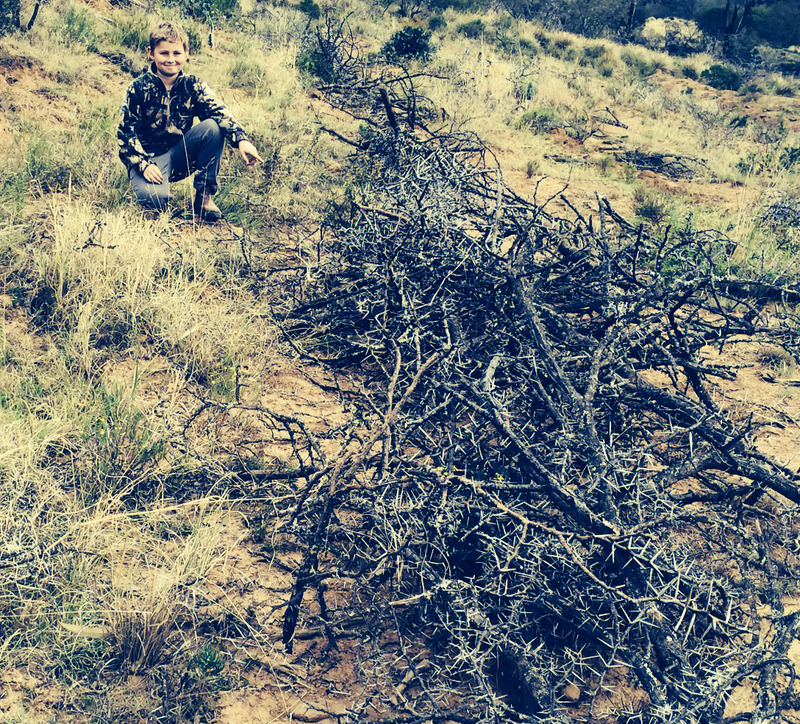 In the case of Newlands, the author, Mike Zingel of Zingela Consulting, worked alongside farm co-owner Frans Bussiahn, to develop and effective veld rehabilitation strategy for the farm. The programme started in 2014 on one of the most seriously affected areas, a North facing eroding slope. It is in land type Fc555, with average annual rainfall of 603mm. The soil has a clay content that varies but is in excess of 20%. 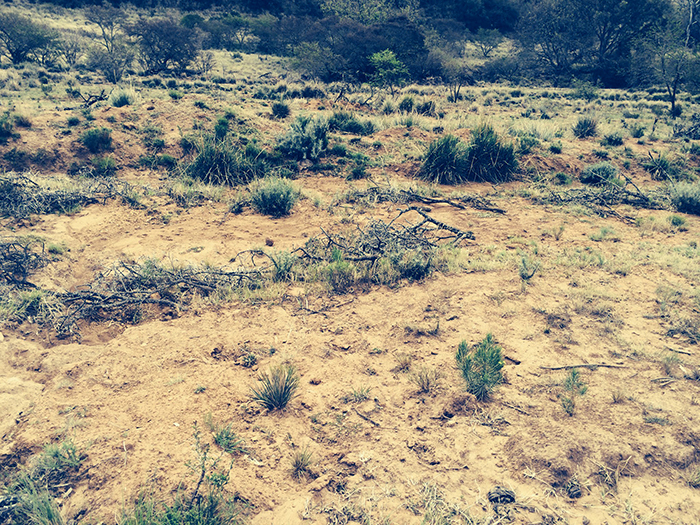 The seedbank that would have been in the top 50mm of topsoil has been lost due to erosion. Rehabilitation calls for establishment of grass and replenishment of the seedbank. Because the early summer of 2013/4 was very dry, Frans had to wait until February 2014 to prepare the slope for seeding. As soon as 25mm of rain had fallen within the period of four weeks he had the soil ripped along the contour with a single tine 400mm to 600mm deep. The moist soil loosened by the rip was generally in small clods, but wherever the clods were large they were broken down manually in preparation for seeding. Seeding was done immediately after the ripping while the soil was still moist. The seed was mixed with a spreading agent consisting of agricultural lime and granular fertiliser and spread superficially on top of the loosened soil. Immediately after that the seed was rolled into the soil by the tyres of the tractor. The effect was to trap the seed in the top layer of the moist seedbed that had been made. Superficial seeding is essential as germination of the grass seed is dependent on sunlight. Another feature is that the compacted 10mm to 20mm of soil acts as a wick descending into the loose soil lower down in the rip. The clay content, 20% or more, allows capillary action to draw the water from lower down the soil profile. Follow-up rain is very important, but even if it is very hot during the day and the soil around the seed dries, as long as moisture rises at night and the seed is moist once every 24 hours, the germination process in grass seed continues. Run-off of follow-up rain from the adjacent unripped ground was trapped in by the somewhat elevated rip and easily soaked into the loosened soil. This barrier effect was increased by brush packing the rip rows. Frans had to brush pack the seeded rip lines as the surrounding area was freely accessible to game. Fencing off of the rehabilitation area was impractical. Brush packing is widely used to protect re-seeded rehabilitation sites. Frans bush packed with branches of Acacillia karroo (Sweet Thorn) from an adjacent bush clearing operation on Newlands. The packing was 1m wide and 1m high. It is essential to use at least 50% thorn bearing brush to reduce damage by game. The height of the brush must be sufficient to allow the planted grass to develop fully, flower and set seed. In this way grass planted at the rate of 7kg to 12 kg per ha of planted area (in Frans’ case 8kg), will produce many times the quantity of seed that was applied. This seed crop will be dispersed in the natural way, some into the same seeded area, but a great deal alongside. Frans left the brush pack in place for the succeeding summer 2015/6 in order for the grasses to reach their full seeding potential. He is now rolling the brush pack one meter in the direction of the silt and debris that has been deposited by run-off, due to it being slowed down by the rip and brush. The rolled brush will then protect the new seed bed that has developed naturally and contains seed shed by the original plants. The brush has already decayed somewhat so that the roll-over material is reduced. However Frans is keeping to the dimensions 1m wide and 1m high to ensure effectiveness, but as a result there are gaps in the new rows. 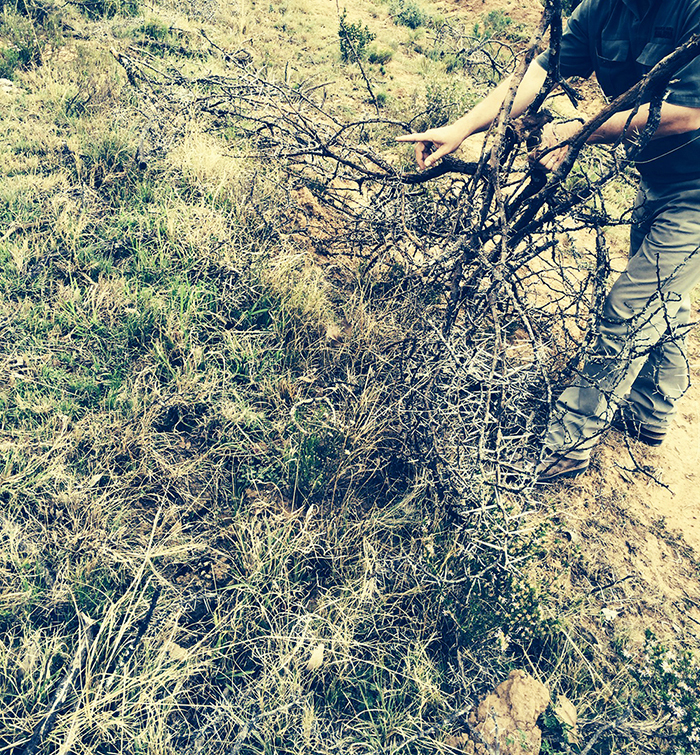 He will have to leave the gaps or else fill with more branches from his bush encroachment control programme. The prospect of heavy rains should La Niña materialise in November is strong motivation for bringing in the additional brush, as this will temper any run-off and save the development being set back by new erosion. The risk of erosion is high due to abnormal La Niña downpours. The risk is elevated due to the probably off run-off from veld at higher elevation. This veld has been grazed short during the past year, the driest the region has experienced since official rainfall records have been kept. The original brush will probably be too far decomposed for another roll in 2017. 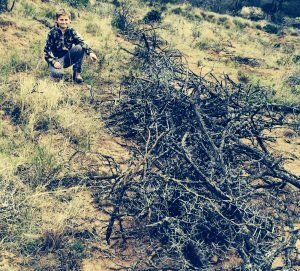 Other suitable brush such as Dichrostachys cinerea (Sickle Bush) and in regions with lower rainfall brush can remain effective for packing for three full seasons. The rehabilitation veld seed mix that was used on Newlands comprises pioneer and subclimax species adapted to the biome. These grasses respond well to disturbed situations and cultivation such as the ripping that was done. They are also prolific seeders so that having been allowed to mature, flower and seed, the original seeding will have gone a long way in causing the seed bank to become replenished. Should disruptive events occur in the future, there will be seed ready in the seed bank to fulfil its natural rehabilitating role. The rehabilitation site on Newlands will change in the years to come as plant succession progresses. Plant succession is inevitable and will happen. The direction can be modified by management interventions. If left to ambient conditions and allowed to develop its own sustainability going forward, the composition of species will change as climax species in the area are dispersed into the sward. Most climax species require a strong pioneer and sub climax sward for their establishment. Depending on variations in the soil, aspect, slope and other topographical features, some of the planted species may well become part of the climax plant community. Climax communities are characterised by wide species diversity with patchy dominance. As Newlands is a game ranch in which sustainable productive vegetation under ambient conditions is the approach, there is every prospect of the area under rehabilitation being restored close to what it was before it became degraded. The key to this outcome is seed to seed to seedbank. Once the door is open good husbandry and natural processes including plant succession will take care of the rest.